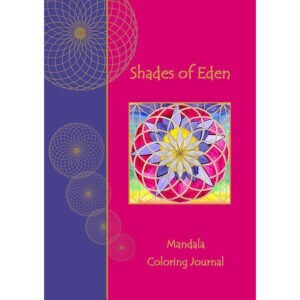 Shades of Eden™ … Mandala Coloring Journal is a unique product which provides a wonderful opportunity to create your own personal spiritual journey of awakening! Shades of Eden™ is a journal with a difference—it contains inspirational messages, high vibrational art, mandala templates to color and contemplate, and plenty of pages for your own journaling and creative inspiration. Its purpose is to support and encourage you to connect more deeply with your True Self and express this within your daily life. Coloring the mandalas offers tremendous potential for interaction with the frequencies and vibrations of creation, which helps you to remember your True and Authentic Self. Journaling the experience helps take you even deeper, and creates a beautiful record of the unfolding adventure. Through the “Shades of Eden” you will experience energies that are the frequencies and vibrations of the New Earth. Feel the energy of Universal Love as it surrounds, warms and supports you!